On the hunt for Edinburgh free WiFi? As much as you will want to put down your gadgets and explore this city, you may need to consult that World Wide Web every now and then. Well, we suggest finding free WiFi in a place where you can also enjoy a tasty cup of coffee. 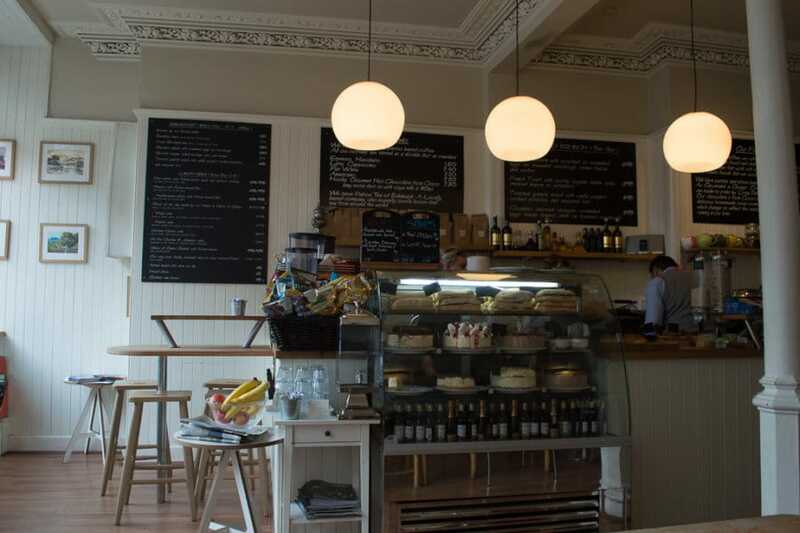 Edinburgh’s cafes have you covered! 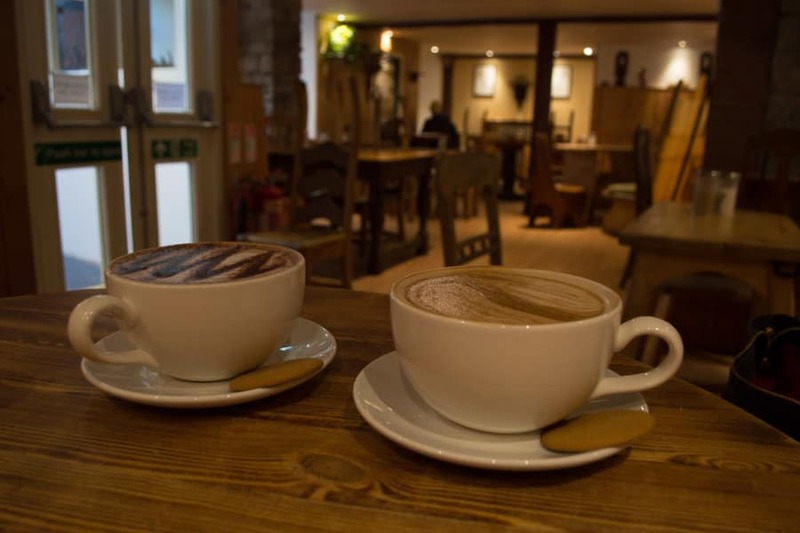 If you’re in Scotland’s capital city check out our list of the best coffee shops in Edinburgh. We based our findings on delicious drinks, nice atmosphere, and convenient location, plus the necessary bonus of Internet. 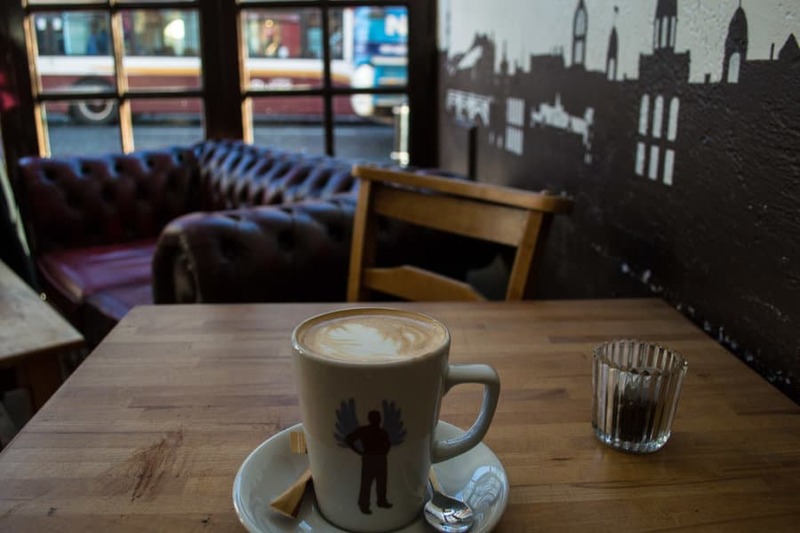 These spots are student, freelancer, and digital nomad-friendly: the best Edinburgh coffee shops with WiFi. Just on the southeast end of Edinburgh’s Old Town, you’ll find a coffee shop with an intriguing, mystical name: Black Medicine. 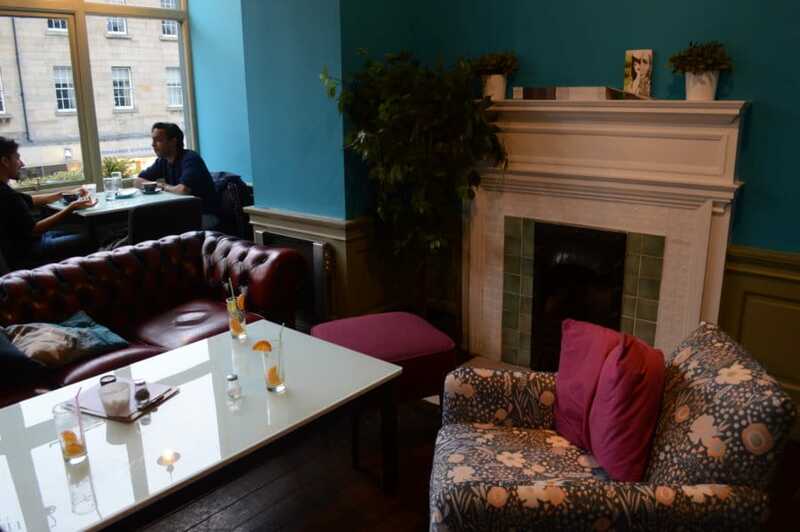 This cafe is close to the University of Edinburgh, and seems very popular with students. The vibe inside is very chill and eclectic. We were captivated by the amount of timber, which lends the cafe a rustic look. The coffee is nice, and drinks are served with a cute little biscuit. There’s plenty of space to sit in Black Medicine, though it can get fairly crowded and you’ll most likely end up in the basement. Not to worry, though, the basement is extremely cozy and with both an upstairs and downstairs WiFi signal, you should have no problem catching the WiFi and getting down to business. 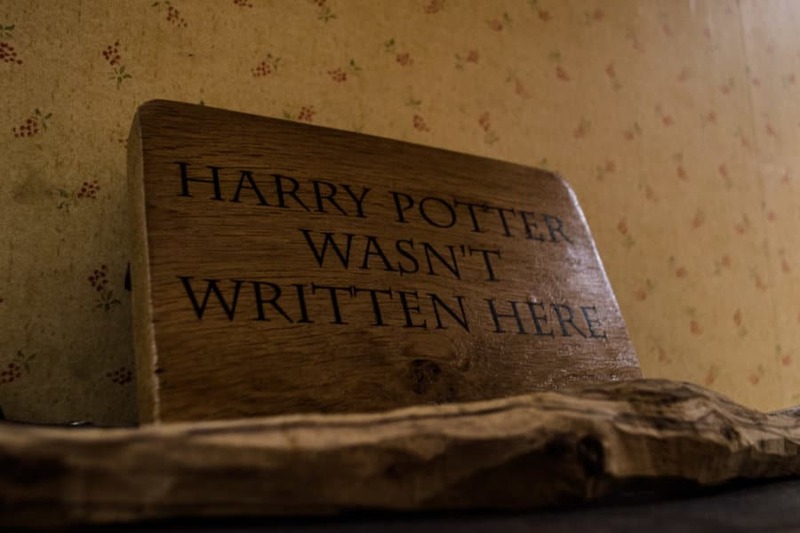 There is a sign outside Black Medicine that claims J.K. Rowling wrote some of the Harry Potter series here, but this other sign in the basement suggests otherwise. Who knows? If you’re after a HP hot spot, head instead to the Elephant House smack in the heart of Old Town. It’s actually a wonderful little coffee shop, but it gets very, very busy. Brew Lab is a dreamy, friendly-staffed coffee house. 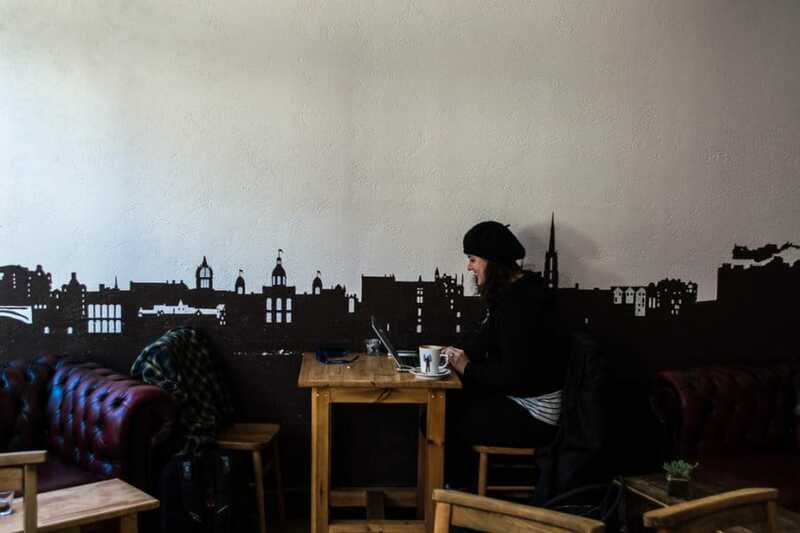 With nooks and crannies for working and chatting with friends, this slightly hipstery Edinburgh coffee shop is always bustling with activity. The WiFi is easy to access and very reliable, and both coffee and tea are a great choice here. In fact, when you order tea, they deliver it with a tiny timer, so you know exactly when your brew is steeped enough for deliciousness. 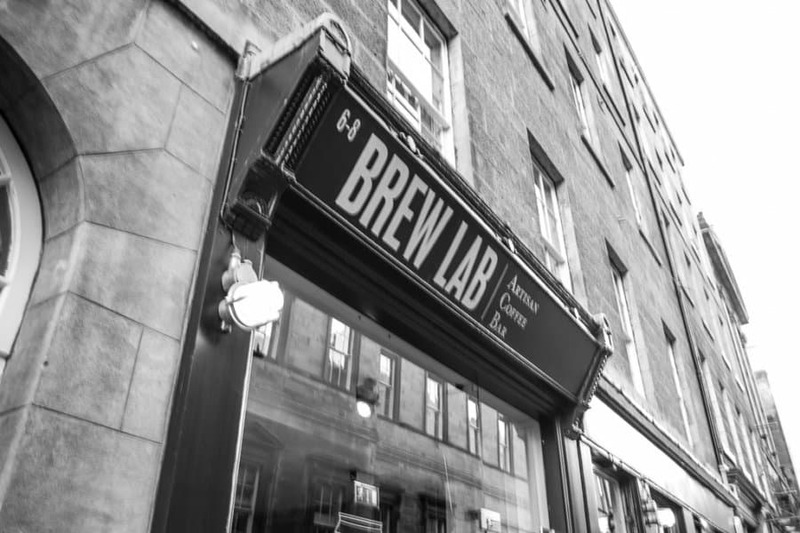 Brew Lab is very close by to Black Medicine, so you can hit two of the best coffee shops in Edinburgh in just one afternoon. While we always love to discover small, independent coffee shops, occasionally, the need for WiFi transcends all other desires. Sometimes, you just gotta get some work done. 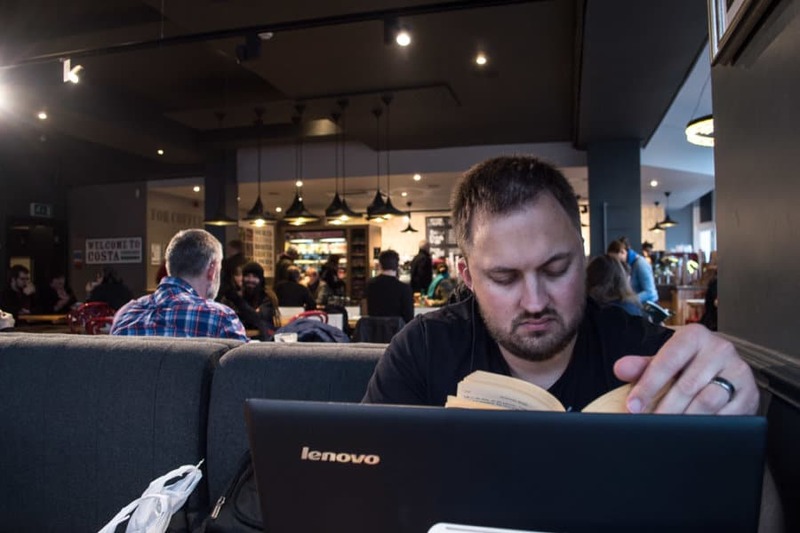 In these instances, you can depend on finding free WiFi in Edinburgh at chain coffee shops like Starbucks, Costa, or Caffe Nero. We don’t mind these places (Caffe Nero makes a lovely hot chocolate) and the WiFi is almost always dependable. Plus, these coffee shops, more than others, are fairly reliable for providing an abundance of electrical outlets. Indie coffee shops, step up your power game! 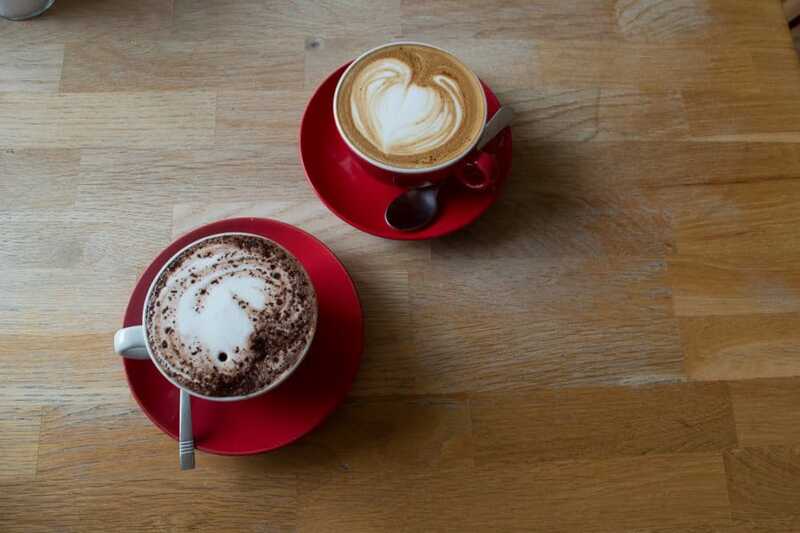 If you’re settling for a chain coffee shop in the middle of it all, we recommend the Costa located on Princes Street just across from the National Gallery. 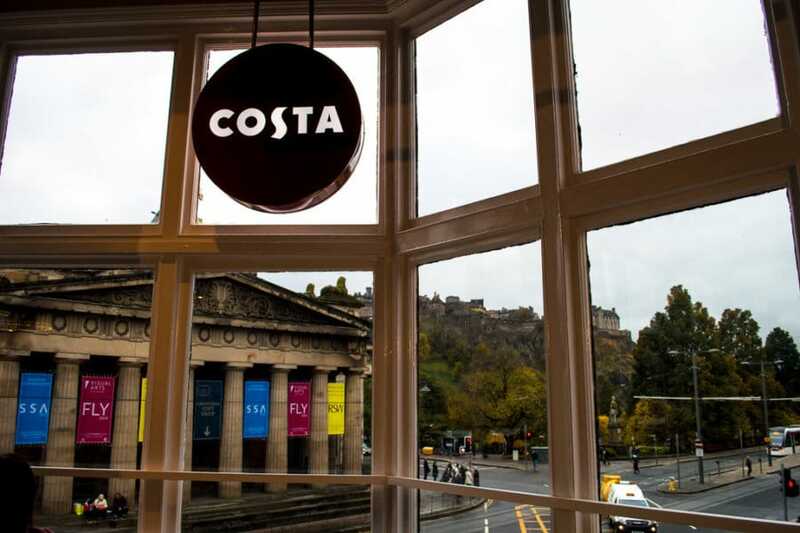 Tucked away in an upstairs location, this Costa has tons of seating, fast & friendly baristas, and best of all, a sweet view of Princes Street Gardens and Edinburgh Castle. Costa has a tasty Christmas menu on now, too (I recommend the Amaretti Latte, mmm). I’d advise asking for an extra espresso shot in your latte, however, as the Costa lattes tend to be a bit heavy on the milk (compared to my usual American style lattes, I guess!). If you’re roughly in the same area as Black Medicine and Brew Lab, you may want to head to a trendier nearby coffee shop. Machina Espresso will fit the bill. I guess we’re not as much of coffee snobs as others, (I like flavored syrups, thank you very much), but Machina Espresso seems to be a cafe for the discerning palette. But the staff is friendly, the vibe is chill, and the layout is pretty cool. There are yummy pastries available, and the WiFi is solid. The space is on the small side, with very few seats, so plan ahead if you need an outlet for your laptop. The location is great, though, and Machina Espresso is definitely a strong addition to the list of awesome Edinburgh coffee shops with WiFi. It’s probably a good thing we didn’t stumble across Coffee Angel at the start of our Edinburgh trip, or we may never have ventured elsewhere. We both really liked Coffee Angel. Great drinks, lots of snack options to keep us fed throughout the day (try the veggie haggis panini), and lots of space, plug access, and excellent WiFi. It’s also very cute inside; check out that Edinburgh city silhouette on the wall behind me. 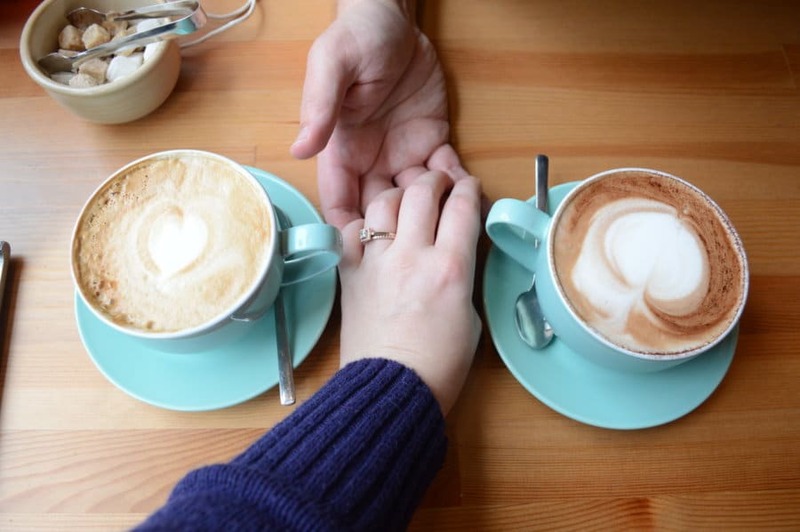 My vanilla latte was delish, and Nathan savored a London fog and an Edinburgh fog (tea lattes with a little twist). It’s also nice to find a coffee shop that offers both spacious tables and comfy couches. This makes this spot an ideal place for both plugging away on a laptop or relaxing with a good book. You’ll find Coffee Angel on Nicolson St. in the Old Town, but apparently there is also a location in the Canonmills area of Edinburgh. Another plus: great prices! 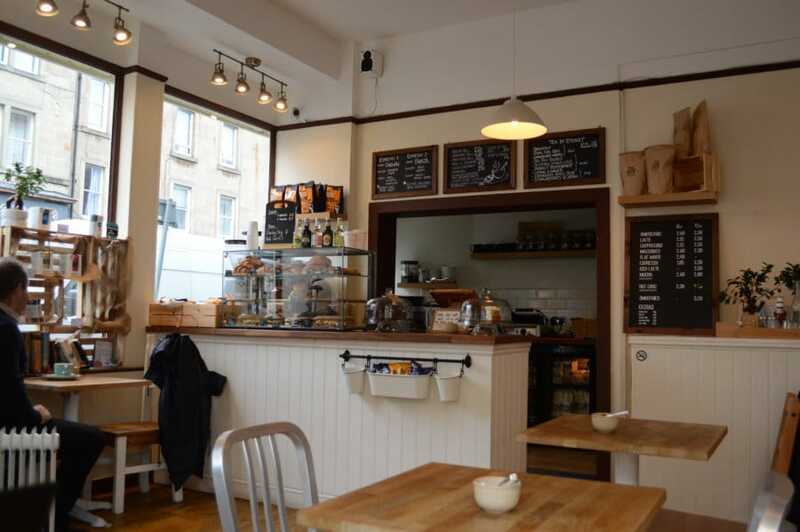 Coffee Angel is definitely one of our favorite Edinburgh coffee shops with WiFi! Hanging out in the posh New Town area of Edinburgh? 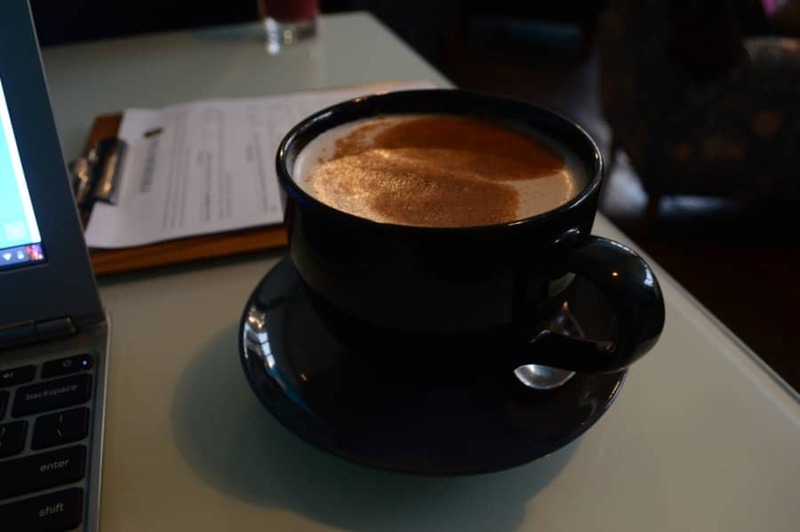 You could choose to get your caffeine fix at a number of Costas and Starbucks, but for a cozy location boasting delicious coffee and even WINE, you should make your way to Frederick’s Coffee House. This is definitely one of the best coffee shops in Edinburgh. This spot is tucked away not far from crowded Princes Street, but it’s a lovely refuge from the crowds. 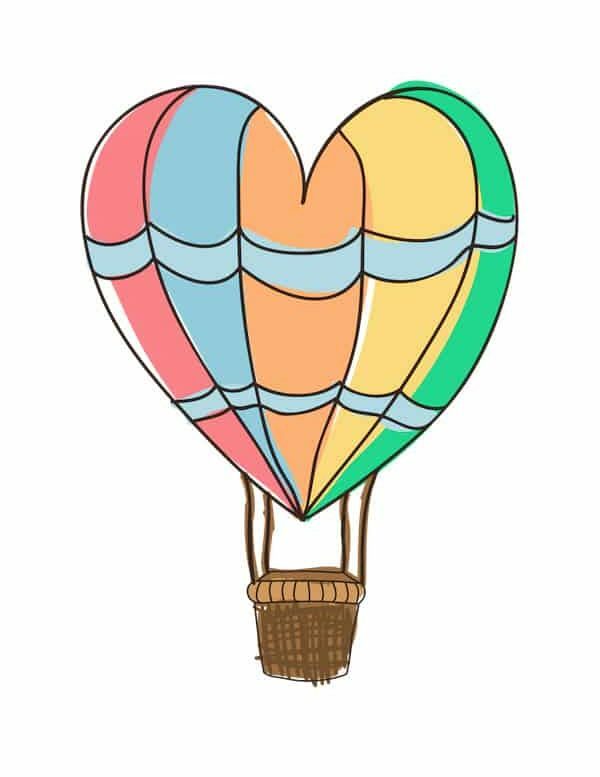 With an upstairs location, you have to keep your eyes peeled to find it. Being on the second floor offers nice views over town through massive windows, and the tables abutting the windows seem to be very popular. Equally popular may be the inviting armchairs, positioned next to two fireplaces—not sure if they light these or if they’re merely decorative. With free WiFi and a menu of snacks and treats, you could comfortably spend hours click clacking on your keyboards. In fact as I finish this article I am diving into a glass of red and anxiously awaiting the arrival of our honey baked camembert. YUM. 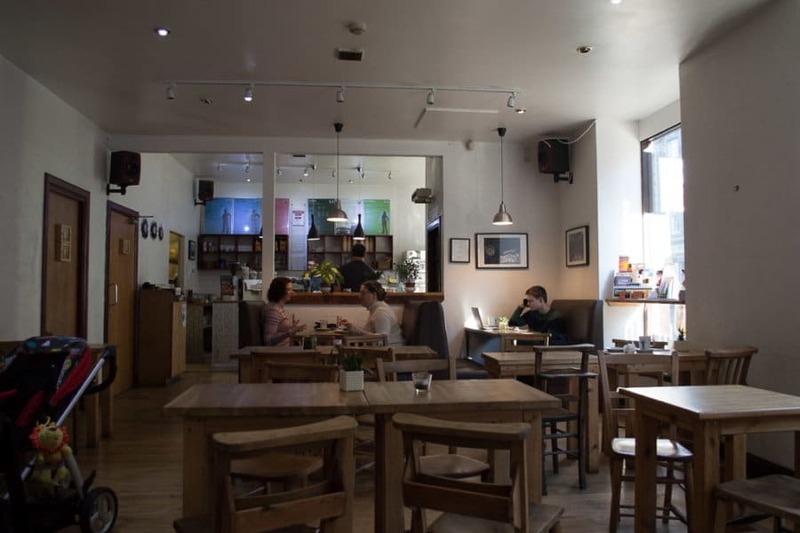 We stumbled upon Printworks Coffee while out and about in the Leith area of Edinburgh. Leith is a cool place to visit when in Edinburgh, as it’s somewhat off the beaten tourist path. Leith is on the water, with a cool shore area boasting lots of wee shops and restaurants. Printworks is among them. With its extensive menu, adorable cushion-covered bench, and uber-friendly service, it’s a lovely little spot for a cuppa. The coffee and hot chocolate we ordered here were really, really awesome. We loved how they looked, too, served in bright red mugs. But it may be the food here that’s truly worth the visit. Nathan enjoyed an enormous Mediterranean platter with meats, cheese, hummus, and olives, while I enjoyed a hot cup of soup and crusty bread. The menu is filled with appetizing and healthy options at great low prices. Give it a try. And what about the WiFi? It’s well-connected network places Printworks Coffee firmly on our lest of best WiFi coffee shops in Edinburgh. The only drawback to this cafe is its small size. We didn’t feel we could sit and work for many hours, simply because of the lack of seating—and this place got busy, a testament to its quality. 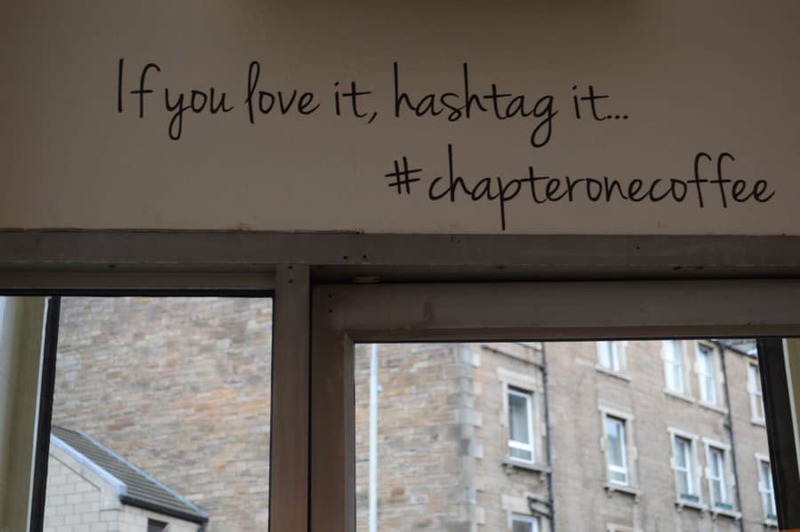 Chapter One Coffee is an idyllic little cafe in the Gorgie area of Edinburgh. I just love the name; it evokes sitting down to pen the next great novel! Our visit to Chapter One was very nice. The mocha and latte we ordered were definitely among the best we’ve had in the city, and they were served in these adorable mint green tea cups. Extra photogenic—though I am always photographing my drinks anyway! Such is the life of an Instagrammer…. Chapter One is easy to get to (it’s right on the #30 bus line) and if you’re wanting to peruse some charity shops (Americans probably know them more as thrift stores), this is a prime location to do so. WiFi works well at this shop (just ask for the password when ordering) and we were easily able to find a table near an outlet. The atmosphere is laid back, and we didn’t feel any pressure to hurry out, though it did perk up around lunch hour. Croissants, chips, and other snacks are also available here, so feel free to stay longer and fill your belly. There are likely many more Edinburgh coffee shops with WiFi that we didn’t get to try, but our few weeks in town flew by. You might also want to check out Lovecrumbs, Kiliminjaro Coffee, and the Hideout Cafe. Lovecrumbs came highly recommended, but we never made it there, unfortunately. That coffee shop has WiFi for sure, although I don’t know about the other two. Though not strictly a coffee shop, the jury’s still out on Under the Stairs, a restaurant and lounge in a somewhat hidden location near the Grassmarket. We tried to go here for dinner (without a reservation, oops) but didn’t get a chance to check it out properly. We did go inside briefly, however, and it’s coziness factor is through the roof! This could be the perfect spot to have a cheeky cocktail and snacks while getting some work done—word on the street is there’s some WiFi there. Happy hunting! And happy coffee sipping in Edinburgh! 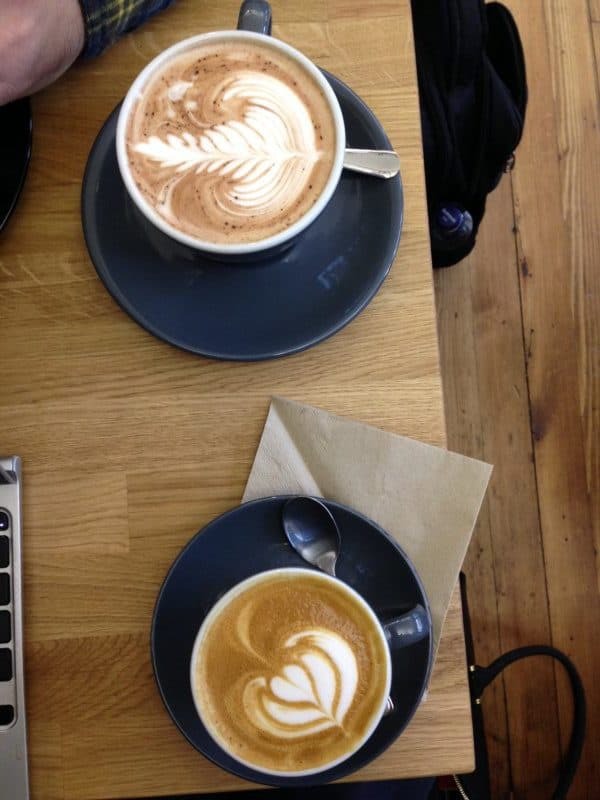 Did we forget any of the best coffee shops in Edinburgh? Let us know in the comments! hi Caroline! Thanks for sharing! Wish we were still there to try more of Edinburgh’s spots. How you travel without Internet is an amazing feat I can’t quite fathom!! Good for you!!! Love these. I was so charmed by Edinburgh and although I was busy drinking the cider, this will be great for when I return. oh yes cider!!! Our other favorite beverage ! haha now you have so many to try!! The Elephant House IS really cute!! Just so crowded lol. Brew Lab is one of my faves the charity that I worked for moved next door to it and let’s just say I spent a little too much there. I can totally understand that! Great chill environment! So many good cafes in Edinburgh, and new ones opening all the time. As to Black Medicine, here’s the story. Rowlings’ brother-in-law owned the cafe, but it used to be located upstairs and was called Nicolson Street Cafe. It certainly was one of the cafes she would write in. After some time, her brother-in-law sold the cafe, and it later became a Chinese restaurant, and now is Spoon Cafe. He went on to purchase the downstairs cafe and called it Black Medicine. So while technically she wrote at her brother-in-law’s cafe, it changed names and moved downstairs. 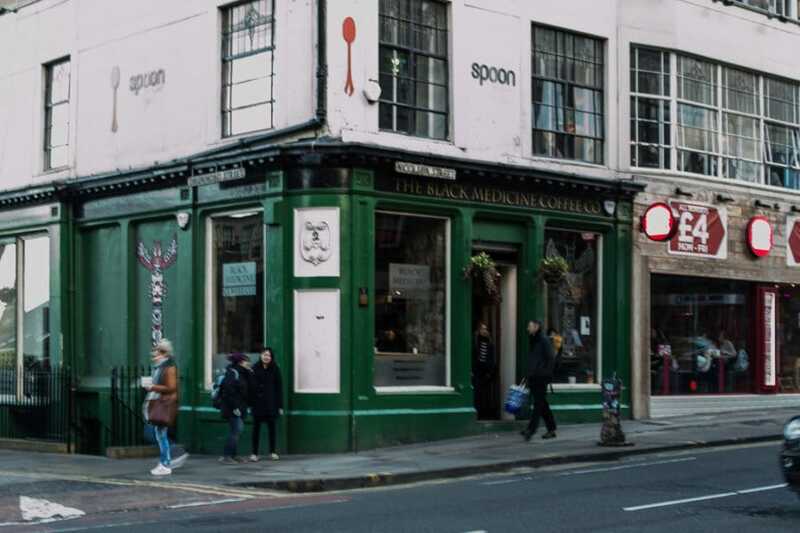 She never wrote in the downstairs location, but there is a sign in Spoon Cafe which proclaims how she would write there back when it was Nicolson Street Cafe. Great shot of Black Medicine. See the little orange pot holding a cactus in the front right window? That pot has the name “Eric” on it – and it is meant to “hold my spot” at BM. I wrote all my academic papers in that corner, and the owner was proud to accept my gift to them – the cactus named “Hairy” and a bottle of Scotch.